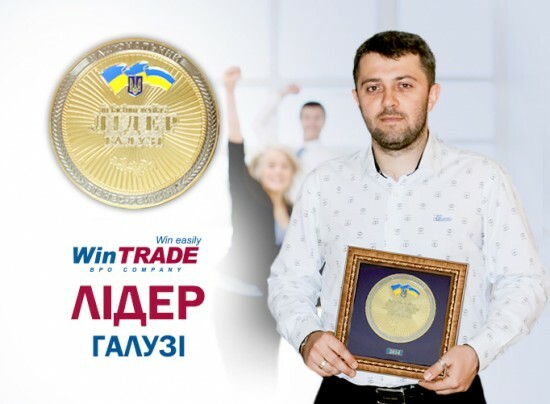 The first Ukrainian WinTRADE ВРО-company has proved the title of “Industry Leader” by winning again the Industry Leader Award in the category “Call centers activity” from rating bureau “National Business Rating”. “Persistence in achieving results is the confirmation of professionalism. It’s not difficult to gain recognition just once; it’s difficult to confirm the leadership from year to year. The market is forging ahead; there are new solutions and innovative technologies as well as constantly increasing competition”. It is not enough anymore for leading companies to be just productive, it’s a must to be the most innovative and the most efficient, to choose the right development strategy, to be able to set trends – there are too few places “at the pinnacle” (on top). In a crisis, we have focused on quality services issues as well as improvement of employee relations, have offered new services to our clients and eventually have become the best again. - says Business Development Director of WinTRADE Dmytro Lytvyn.